A modern take on Gothic suspense with a literary twist? Sign me up. I first learned of Griffiths’ forthcoming standalone suspense novel THE STRANGER DIARIES at Bouchercon this past fall, and have been eagerly anticipating its release ever since. In THE STRANGER DIARIES, Griffiths (best known for her Ruth Galloway series) crafts a suspense novel centered around a teacher of Gothic literature, who finds the plot of one of the books she uses in her courses playing out in real life… to potentially deadly end. From its stunning cover to its bookish plot and Gothic-inspired touches, THE STRANGER DIARIES has all the makings of an instant-favorite for me - and I couldn’t be more excited to give you the inside scoop on this book today! Thanks to the team at Houghton Mifflin Harcourt, I’m thrilled to share with CBTB readers an early excerpt of the book’s first chapter. 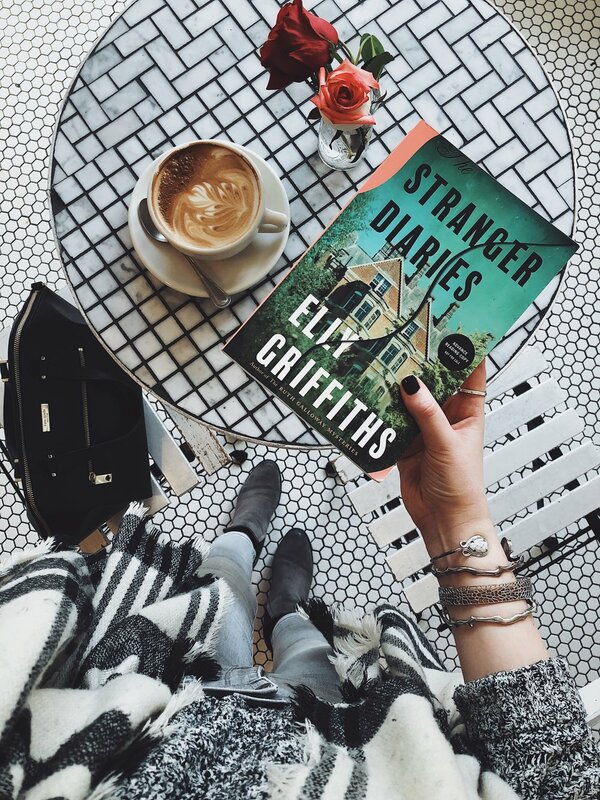 THE STRANGER DIARIES releases in the US in March, but you can get a taste of Griffiths’ captivating writing right here. And let me just say: I’m currently reading THE STRANGER DIARIES, and have found it to be absolutely gripping from page one. So far, it’s exceeding all my expectations, and I can’t wait for you to give it a read, too! Many thanks to the team at HMH for providing an excerpt from Elly Griffiths’ THE STRANGER DIARIES for CBTB readers! Read on for plot details, a selection of the incredible early praise the book is already receiving, links to pre-order, and (of course!) the excerpt itself. This post contains affiliate links. Crime by the Book is a participant in the Amazon Services LLC Associates Program, an affiliate advertising program designed to provide a means for sites to earn advertising fees by advertising and linking to Amazon.com. This in no way affects my opinion of the book featured here. Clare Cassidy is no stranger to murder. A high school English teacher specializing in the Gothic writer R. M. Holland, she teaches a course on it every year. But when one of Clare’s colleagues and closest friends is found dead, with a line from R.M. Holland’s most famous story, “The Stranger,” left by her body, Clare is horrified to see her life collide with the storylines of her favorite literature. "Griffiths has gifted readers with a gripping homage to the gothic novel...An entrancing literary tour de force in which Shakespeare’s line, 'Hell is empty,' from The Tempest, cleverly connects past and present. Georgette Heyer fans will relish this, as will readers who enjoyed Diane Setterfield’s The Thirteenth Tale and Anthony Horowitz’s Magpie Murders." ‘If you’ll permit me,’ said the Stranger, ‘I’d like to tell you a story. After all, it’s a long journey and, by the look of those skies, we’re not going to be leaving this carriage for some time. So, why not pass the hours with some story-telling? The perfect thing for a late October evening. Are you quite comfortable there? Don’t worry about Herbert. He won’t hurt you. It’s just this weather that makes him nervous. Now, where was I? What about some brandy to keep the chill out? You don’t mind a hip flask, do you? Well, this is a story that actually happened. Those are the best kind, don’t you think? Better still, it happened to me when I was a young man. About your age. I was a student at Cambridge. Studying Divinity, of course. There’s no other subject, in my opinion, except possibly English Literature. We are such stuff as dreams are made on. I’d been there for almost a term. I was a shy boy from the country and I suppose I was lonely. I wasn’t one of the swells, those young men in white bow ties who sauntered across the court as if they had letters patent from God. I kept myself to myself, went to lectures, wrote my essays and started up a friendship with another scholarship boy in my year, a timid soul called Gudgeon, of all things. I wrote home to my mother every week. I went to chapel. Yes, I believed in those days. I was even rather pious—‘pi’, we used to say. That was why I was surprised to be invited to join the Hell Club. Surprised and pleased. I’d heard about it, of course. Stories of midnight orgies, of bedders coming in to clean rooms and fainting dead away at what they discovered there, of arcane chants from the Book of the Dead, of buried bones and gaping graves. But there were other stories too. Many successful men had their start at the Hell Club: politicians—even a cabinet member or two—writers, lawyers, scientists, business tycoons. You always knew them because of the badge, a discreet skull worn on the left lapel. Yes, like this one here. So I was happy to be invited to the initiation ceremony. It was held on October 31st. Halloween, of course. All Hallows’ Eve. Yes, of course. It’s Halloween today. If one believed in coincidence one might think that was slightly sinister. ‘That’s a bit of a cliché,’ says Ted. ‘That’s a rip-off of Murder on the Orient Express,’ says Peter. No one can. It’s mid-afternoon, nearly break time, and they are thinking of coffee and biscuits rather than fictional archetypes. I look out of the window. The trees by the graveyard are dark even though it’s only four o’clock. I should have saved the short story for the twilight session really, but it’s so difficult to cover everything on a short course. Time to wrap things up. to learn that the author of The Stranger actually lived in this house. In fact, he hardly ever left it. He was a recluse, the old-fashioned sort with a housekeeper and a full staff. I’m not sure I would leave the house myself if I had someone to cook and clean for me, to iron The Times and place it on a tray with my morning infusion. But I have a daughter, so I would have to rouse myself eventually. Georgie would probably never get out of bed without me to shout the time up the stairs, a problem R.M. Holland certainly never had, although he may, in fact, have had a daughter. Opinion is divided on this point. It’s October half-term and, with no pupils around, and spending all my time in the Old Building, it’s easy to imagine that I’m teaching at a university, somewhere ancient and hallowed. There are parts of Holland House that look almost like an Oxford college, if you ignore the New Building and the smell of the gymnasium. I like having this time to myself. Georgie is with Simon and Herbert is in kennels. There’s nothing for me to worry about and, when I get home, there’s nothing to stop me writing all night. I’m working on a biography of R.M. Holland. He’s always interested me, ever since I read The Stranger in a ghost story anthology as a teenager. I didn’t know about his connection to the school when I first applied here. It wasn’t mentioned in the advertisement and the interview was in the New Building. When I found out, it seemed like a sign. I would teach English by day and, in the evenings, inspired by my surroundings, I would write about Holland; about his strange, reclusive life, the mysterious death of his wife, his missing daughter. I made a good start; I was even interviewed for a news item on local TV, walking awkwardly through the Old Building and talking about its previous occupant. But, recently—I don’t know why—the words have dried up. Write every day, that’s what I tell my students. Don’t wait for inspiration, that might not come until the end. The muse always finds you working. Look into your heart and write. But, like most teachers, I’m not brilliant at taking my own advice. I write in my diary every day, but that doesn’t count because no one else is ever going to read it. I suppose I should go downstairs and get a coffee while I still can. As I get up I look out of the window. It’s getting dark and the trees are blowing in a sudden squall of wind. Leaves gust across the car park and, following their progress, I see what I should have noticed earlier: a strange car with two people sitting inside it. There’s nothing particularly odd about this. This is a school, after all, despite it being half-term. Visitors are not entirely unexpected. They could even be staff members, coming in to prepare their classrooms and complete their planning for next week. But there’s something about the car, and the people inside it, that makes me feel uneasy. It’s an unremarkable grey vehicle—I’m useless at cars but Simon would know the make—something solid and workmanlike, the sort of thing a mini-cab driver would use. But why are its occupants just sitting there? I can’t see their faces but they are both dressed in dark clothes and look, like the car itself, somehow both prosaic and menacing. It’s almost as if I am expecting a summons of some kind, so I’m not really surprised when my phone buzzes. I see it’s Rick Lewis, my head of department. Excerpted from The Stranger Diaries. Copyright © 2019 by Elly Griffiths. All rights reserved. No part of this excerpt may be reproduced or reprinted without permission from the publisher.